SCORE, a U.S.-based nonprofit association dedicated to educating entrepreneurs and helping small business start, grow and succeed nationwide, has launched e-Business Now, a new small business learning website for entrepreneurs. The website provides small business leaders with a range of tools for learning how to leverage technology, including workshops, “how-to” guides (such as ‘How To Use Technology To Drive sales On Your Website’), connections to technology mentors and more. On-demand online workshops, a key aspect of the site, covers topics such as digital literacy to e-Commerce, search optimization, cyber security, hardware use, Web 2.0 tools, and social media and more (for example, see ‘Applying Technology to Improve Your Cash Flow‘). Founding partners of e-Business Now include AT&T, Best Buy, Cisco, Constant Contact, the Federal Communications Commission (FCC), Google, Hewlett-Packard, Intuit, Microsoft, the U.S. Small Business Administration (SBA), SCORE, The SCORE Foundation, Skype and Time Warner Cable. Since 1964, SCORE has helped more than 9 million aspiring entrepreneurs. 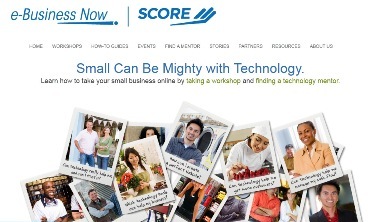 Each year, SCORE provides small business mentoring and workshops to more than 375,000 new and growing small businesses. More than 13,000 business experts volunteer as mentors in 354 chapters serving local communities with entrepreneur education to help grow 1 million small businesses.